People who think the NFL did a poor job investigating and punishing former Baltimore Ravens running back Ray Rice are circulating a photo on the Internet that is turning the NFL’s partnership with CoverGirl on its head. 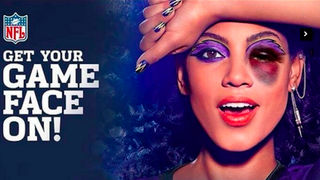 One of the photos from the Get Your Game Face On campaign, which originally showed a female model’s face with purple wings around her eyes, has been altered so that the makeup worn by the female model is trying to cover up a severe eye bruise that she presumably sustained during a domestic violence incident. The photo went viral this past weekend on Twitter and, according to Jezebel, “was paired with the hashtag #GoodellMustGo,” a reference to NFL Commissioner Roger Goodell. Goodell and the NFL came under fire in February for issuing a two-game suspension to Ray Rice for hitting his then-fiancee, Janay Palmer, in an elevator. When TMZ released footage in September that showed the entire incident—Rice is shown striking Janay’s face—Rice was cut from the Ravens and the NFL suspended him indefinitely. But there was a renewed sense of anger toward the NFL when reports surfaced that the league had already seen the footage several months earlier. There’s the sense that the NFL only took the matter seriously once the public saw the video. The official page for the Get Your Game On campaign is down at the moment.